Standard and Custom wound AC and DC current Transformers DC voltage isolating transformers and isolating amplifiers. Closed Loop Hall Effect Current Transformers are widely used in a variety of applications requiring an accurate, fast response signal proportional to the current being measured. Products are available for Panel and PCB mounting covering primary currents up to 1500A and provide complete galvanic isolation between primary and measuring circuit. A more recent development is the HES range, which is a free standing detector coil assembly incorporating coil and Hall element only. This enables users to configure a Closed Loop Hall Effect Current Transformer to their own specification and to integrate the electronics within their own circuitry. Closed Loop Hall Effect Current Transformers use ampere-turn compensation method to enable measurement of current from DC to high frequency with the ability to follow rapidly changing level or wave shapes. The application of primary current (lp) causes a change of flux in the air gap. This in turn produces a change in output from the Hall Element away from a steady state condition. This output is passed through the secondary winding, causing a magnetizing force to oppose that of the primary current, thereby reducing the air gap flux. The secondary current will increase until the flux is reduced to zero. At this point the Hall Element output will have returned to the steady state condition and the ampere turn product of the secondary circuit will match that of the primary. 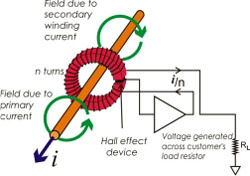 The current that passes through the secondary winding is the output current. The transformation ratio is calculated by the standard transformer equation. The HES range is a Hall Element and coil assembly enabling the implementation of a full Hall Effect Current Transformer by the addition of the requisite electronic circuitry, suitable for currents up to 100A. The range is available in both vertical (VT) and horizontal (HR) mounting. Full details of recommended electronic circuitry available on request. Typical performance with recommended circuitry is as follows.